Downtown Clayton is a popular regional destination that serves as a centrally located hub for businesses, a wide variety of restaurants and boutique shops. The City of Clayton wants visitors and residents to enjoy all the city has to offer at all times of the day so there is a renewed emphasis on residential projects in the city limits. New developments are being built near the Clayton MetroLink Station which is located at Forest Park Parkway between South Central Avenue and South Meramec Avenue. Developers CA Ventures and White Oak Realty Partners recently completed a $75 million apartment tower at 212 South Meramec Avenue, just a block north of the Clayton MetroLink Station. The Two Twelve Clayton project includes 26 stories with ground floor retail and 250 luxury apartments. Apartments include one, two, and three-bedroom options, ranging in size from 592 to 1,366 square feet and in price from $1,706 to $4,415. The building also includes a rooftop amenity level that features a pool deck, lounge, chef’s kitchen, recreation room and fitness center. The project will bring more people within convenient walking distance of the Clayton MetroLink Station, making transit an attractive option for residents. This project was completed in summer of 2017 and is now leasing. 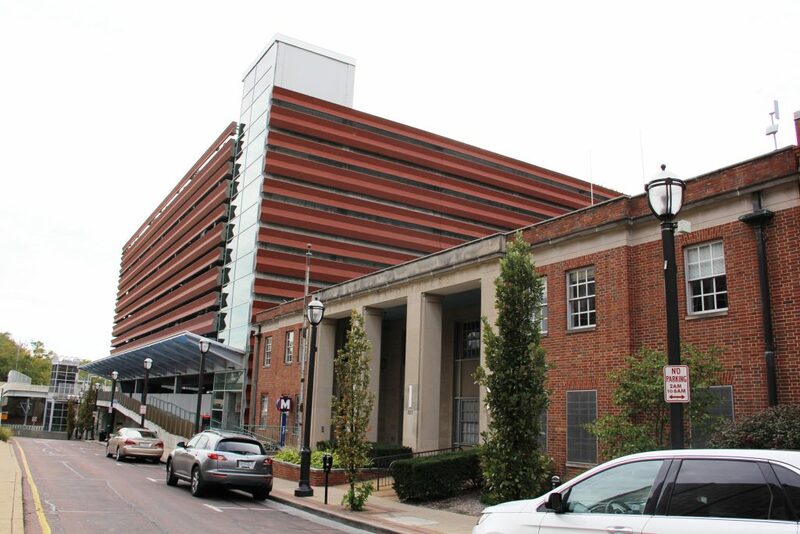 Another notable development that is under construction or in the planning stages for downtown Clayton is the redevelopment of the former Clayton Police Headquarters at 227 South Central Avenue, adjacent to the parking garage by the Clayton MetroLink Station. Montana-based developer HomeBase, partnering with local developer Keeley Companies, plans to develop the property with a 10 to 12 story hotel with 200 rooms, a rooftop bar and a ground-floor restaurant open to the public. The project will allow visitors to downtown Clayton to travel from the airport to their hotel, as well as reach destinations in downtown St. Louis and throughout the area, using MetroLink, removing the hassle of renting a car or catching a cab. The project will also add to the walkability of Clayton by providing a more attractive environment for pedestrians and transit riders as they walk up Central Avenue to destinations throughout downtown Clayton. Additionally, it is proposed that up to 100 of the city’s parking spaces in the adjacent garage will be subleased to the company, cutting down on the developer’s costs and removing the need for additional parking. The City of Clayton recognized the value of encouraging good TOD projects, and implemented a TOD Overlay Code for both the Forsyth and the Clayton MetroLink Stations. The TOD Overlay Code is an optional zoning code that encourages denser, mixed-use developments through mechanisms like no maximum building height, no minimum parking requirements, requiring linkage to the MetroLink Station, and streetscape and greenspace improvements. The Two Twelve Clayton project utilized this overlay code to allow for less parking and the 26-story height. The hotel proposed at the former Clayton Police Headquarters also plans to use the TOD Overlay Code to incorporate TOD elements into the project. Gary Carter, Clayton Director of Economic Development, sees the value of these projects so close to transit. “These projects, which represent the successful execution of Clayton’s 2010 Downtown Master Plan, provide new residents and future visitors with a less auto-dependent option while bringing vibrancy to two major pedestrian corridors,” Carter said. These projects add to the liveliness of the already booming downtown Clayton, and they bring more people closer to transit, making it easier for residents and visitors to enjoy a car-optional lifestyle while still enjoying access to the entire St. Louis region. Timeline: Construction to tentatively begin in 2018 with planned completion in late 2019.